This extension auto-hides your Firefox/Thunderbird's tab bar. It can also relocate the tab bar to the bottom of the browser window. It supports Thunderbird since version 2.0. In version 2.6, a hot key is added to switch the tab bar on/off quickly. By default, it is disabled. To enable it, open the Options dialog and check option "Double-press Ctrl key to show/hide Tabbar". After that, you can press the Ctrl key twice to hide/show the tab bar. In version 2.6.1, another hot key Alt is added. Those who do not want to use Ctrl as the hot key can use Alt instead. Enable it in the Options dialog. After you install the extension and restart Firefox/Thunderbird, the tab bar is hidden automatically. After the tab bar is hidden, a tiny plain bar would be placed at the tab bar's old position, e.g. the edge of the content panel. By moving the mouse to the plain bar, you can make the tab bar shown again. Right click on the tab bar, you can see a menu item of Autohide Tabbar. Use it to toggle the feature on or off. It will only make the change on the current browser window and any new browser window you will open. To turn the feature on or off for all currently opened windows, use the next method. You can also toggle this feature by the extension's Options dialog, which is accessed from the menu Tools|Add-ons|Extensions. Select our extension Autohide Tabbar and click the button Options/Preferences. 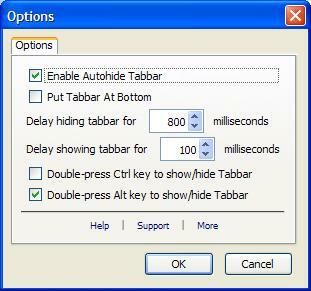 In the Options dialog, toggle the checkbox of Enable Autohide Tabbar. When you are toggling the tab bar on and off with the mouse, the web page in the content panel would looks jumping up and down because the content panel is being resized against the top edge. Some people may find that annoying. An option was added in version 1.1 to allow you relocate the tab bar to the bottom of the content panel so that the web page would not look jumping. To do that, open the Options dialog via the menu Tools|Add-ons|Extensions|Autohide Tabbar|Options(or Preferences), and toggle the checkbox of Put Tabbar At Bottom. The new setting will take effect after the next time you restart Firefox/Thunderbird. As always, after the installation, you need to restart Firefox/Thunderbird. - Enable Autohide Tabbar: if it is checked, the extension is enabled. By default, it is checked. - Put Tabbar At Bottom: if it is checked, the tab bar is placed at the bottom of the browser window -- above the status bar. After you change this setting, you need to restart Firefox/Thunderbird. By default, it is not checked. - Delay hiding tabbar: how long in milliseconds to delay hiding the tabbar when the mouse moves away. - Delay showing tabbar: how long in milliseconds to delay showing the tabbar when the mouse moves into the tabbar area. - Double-press Ctrl key to show/hide tabbar: use the Ctrl key as the hot key to show/hide tabbar. - Double-press Alt key to show/hide tabbar: use the Alt key as the hot key to show/hide tabbar. This extension respects Firefox's own Tabs Auto-hide option -- which auto-hide the tab bar when there is only one tab. So if you have only one open tab, no matter where you point your mouse, the tab bar will not be shown. To disable Firefox's own Tabs Auto-hide, open Firefox's Options dialog via menu Tools|Options (or Edit|Preferences in Linux), and click icon Tabs, then check Always show the tab bar. It is recommended that you should do that. If you place the tab bar at the bottom, you may find it takes more effort when you use the '+' button on the tab bar to open a new tab and then type in the address bar. You may consider add a New Tab button to the menu bar so that you do not have to move the mouse all the way across the browser. To do that, right click on the menu bar and select Customize..., and drag the New Tab icon to the menu bar. You can, of course, always use the shortcut Ctrl-T to open a new tab. This extension works with mouse. If you use only the keyboard, do not install it. Sometimes when the mouse quickly cross the hidden tar bar, the tar bar will be shown but not be hidden again. That is because our extension can only receive the mouseover event of the tiny plain bar but the mouseout event of the just-shown tar bar may be lost. If that happens, just move your mouse a little bit on the web page to trigger the hiding of the tar bar. When you open a new tab, the tabbar is not shown. That gives you better privacy. If the new tab is not shown (e.g. when you open it by middle-click a link), you can switch to the new tab by using shotcut Ctrl-PgDn. You can also use other shortcuts to quickly switch tabs, e.g. Ctrl-1 to the first tab. Install another extension Packed Menu together and you would get a neater interface. If you like this extension, please recommend it to your friends. Is there any possibilty to make this work with Thunderbird 3, too??? I really like this addon, sadly it stops working when used together with other addons like "custom download manager", "download manager tweak", "tab popup" and lots of others. Any chance to fix this? I love this extension. Great! I have one wish for the future. Would it be possible to implement an option that allow to hide the tab bar only if one tab is open? If you want to hide the tab bar only if one tab is open, you don't need this extension. Just use Firefox's built-in tab bar feature: Open Firefox's Options dialog via menu Tools|Options (or Edit|Preferences in Linux), and click icon Tabs, then uncheck "Always show the tab bar". As due to Lightning I wish to access the Tabbar when exactly one tab is opened. Right now a second tab is needed to activate the show on hover feature. I have tried those other extensions of "custom download manager", "download manager tweak", "tab popup" and "personas". Autohide Tabbar works well with them. Maybe the problems were caused by other reasons? I am using Firefox 3.6. Version 2.1: when a new tab is opened, tab bar will be automatically hidden right after. the only thing id like to see it do is instead of pushing the page down/up when you scroll over the tab area to just have it overlap the page. Would you add "shift" or "Caps Lock" key to show/hide Tabbar? For people using Chinese/Japan/Korea Input Method, we use "ctrl+space" to toggle input method on and off. It means ctrl key is used frequently, then tabbar is triggered again and again. Add shift key maybe a good idea for us. I would consider more options for the hot key in the future release. Thanks for the suggestions. Just updated to Firefox 4.0b7 and your add-on is no longer supported. Please update as this is a great add-on! I love the idea of your autohide tabbar but I want it for one primary reason: to be able to hide or un-hide the tab bar with a hot key. I tried doing this by making the delay for auto-hiding very long (9999 seconds) but the extension ignored this setting and still hides the tab bar automatically. Help? The delay is not in seconds, but in milliseconds. 9999 ms is only 10 seconds long. If you want to disable auto-hide feature but use only the hot key. You can deselect the "Enable Autohide Tabbar" option. The one big thing that bugs me is, When you close a tab the tab bar disappears, There are many times I would like to close a few tabs quickly, this makes it very hard to do and takes extra time. if if you could fix it to where when you close a tab the tab bar stays open I would very happy!!! breutus, please try the new version 2.8. It fixes the problem that bugged you. I have a problem: I'd like to enable both alt and ctrl for the double-keypress method of display of tab bar. This would make it quicker to use: I would not have to aim so accurately to find the key to tap. Autohide Tabbar should allow ctrl-ctrl, and it should allow alt-alt; but it should DISALLOW ctrl followed by alt, or alt followed by ctrl. But Autohide Tabbar acts on those latter combinations even though neither alt nor ctrl is double-tapped. Ctrl and alt are used together a whole lot for global hotkeys in Windows; and in this use, they are pressed nearly simultaneously, so my activating some Windows global hotkey looks to Autohide Tabbar like it should display the tabs. Thus, I can't enable both ctrl and alt in Autohide Tabbar's options. If this were acknowledged as a bug and fixed, that would be great! Any possibility to get Autohide Tabbar to work with TB 5? I'm really missing it since I updated. From FF7 on (I'm on FF8 now) Autohide Tabbar 2.8 seems to disable the Ctrl-1 - Ctrl-9 keyboard shortcuts while the tab bar is hidden. In Firefox 24 I have not the option "Put Tabbar At Bottom". And the option is not working in about:config. Won't work with Thunderbird 17.0.8.
this plug-in on Firefox 23.0.1, can't resume one tab page. thanks for the wonderful add-on! I usually leave it in manual mode ("Enable Autohide Tabbar" unchecked), using the double-press shortcut to hide and show the tabbar. The problem with that is that is that tab events such as "New Tab" will make the tabbar reappear. Would there be any way to make the manual selection stick? I think it's a general quirk that affects the automatic mode as well. Thanks for the suggestion. This feature may not be easy to implement. We will see whether we could find a way. I have been a regular user of your addon Auto-hide Toolbar. I like the functionality very much. For some reason, the auto-hide feature doesnt work though. I have been using this addon for minimizing the tab bar manually using double-alt presses, but the automatic option doesnt work for me. I think it is because of some other addon that I have - could be Tab Mix Plus or Hide Caption Titlebar Plus or some other. Any suggestion to make it work would be of great help. I am running pale moon and had to reinstall. Now I cannot download autohide tabbar from the add-ons site. Could you please help me get a copy of an old version? It works great on my browser and normally I wouldn't bother you, but my backups are nowhere to be found...Please help me out. It says you removed it from the add-ons site. I'm guessing that has to do with firefox's evolution to web extensions, but my browser is meant to work with the old add-ons (and I prefer it that way). I have enabled the extension on the Mozilla add-ons site. It is the last release version 2.8.1. You can download it there if you want. I am glad to know it is still wanted. Thanks! I need this add-on or firefox 57 (Quantum).